Welcome to www.onapolo.com. By using this website you accept and agree to be bound by these online Shopping Terms and Conditions, the Privacy Statement and such other policies as we notify you of from time to time, which together constitute the entire agreement between us. Nothing in these Online Shopping Terms and Conditions affects your statutory rights, either as a consumer or otherwise. These Online Shopping Terms and conditions apply to all orders which you, the customer, place using our website www.onapolo.com, which is operated by The Argentine Trading Company Ltd. Please read them carefully before placing your order and print a copy for future reference. We have made every effort to display the colours, specifications, dimensions and descriptions of items on the Website as accurately as possible. The colours you see will depend on the resolution of your monitor. We cannot guarantee that your monitor’s display of any colour will always reflect accurately the colour of the item delivered. We may from time to time vary the dimensions, specifications, descriptions and quantities of items displayed on our Website without prior notice. www.onapolo.com its products and content is protected by national intellectual property. You are only allowed to use content found on this Website as expressly agreed by The Argentine Trading Company Ltd. Any reproduction or redistribution of our products and content may result in civil and criminal penalties. In addition to these intellectual property rights, the content, defined as: graphics, photographs, image rights, sounds, music, audio or text are to the best of our knowledge accurate and complete, however we cannot promise it is error-free. www.onapolo.com cannot promise the functions within the site i.e. html, content and functional aspects are error-free. This also relates to viruses and other harmful viruses; we always recommend that you should have an up-to-date and complete virus-checking software to protect yourself. You should also agree that no joint venture, partnership, employment or agency relationship exists between yourself and The Argentine Trading Company Ltd nor Ona Polo. You will not express yourself as an employee, agent or representative of The Argentine Trading Company Ltd nor Ona Polo and we are not liable for any representation, act or omission on your part. Ona Polo and all other names, logos, and icons identifying Ona Polo and its programmes, products, and services, including any logos, page headers, icons, designs, or trade dress and whether not appearing in large print or with an accompanying symbol, are proprietary trademarks of The Argentine Trading Company Ltd and are protected from reproduction, imitation, dilution, or confusing or misleading uses under national and international trademark and copyright laws. Other product and company names mentioned herein may be the trademarks and/or service marks of their respective owners. 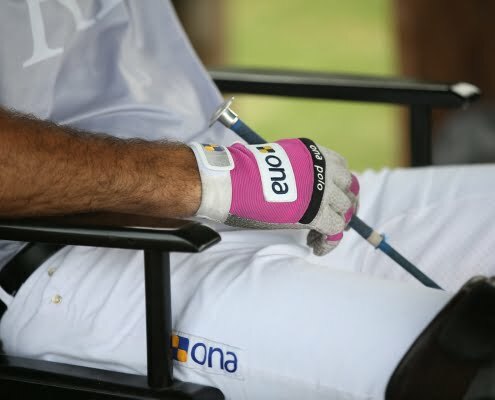 Any use of such marks without the express written permission of The Argentine Trading Company Ltd is strictly prohibited, and nothing stated or implied on the Ona Polo platforms confers on you any license or right under any trademark of Ona Polo or any third party. Products are invoiced in GBP sterling at the price prevailing at the time you place your order. Prices displayed on the Website include Value Added Tax which will be charged at the current rate. Where prices are displayed in alternative currencies on this website, these are for reference purposes only and local prices may change according to current currency rates. Whilst we try and ensure all details, descriptions and prices are correct when appearing online, some products might be subject to slight variations. Prices displayed on the Website apply to online purchases only. They are not indicative of the price of identical items purchased in other stores or by any other means. We reserve the right to update prices displayed on the Website at any point. The Argentine Trading Company Ltd is PCI compliant, meaning your card details are not kept. Should we need to issue a refund due to a price change or item being out of stock we will need to re-contact you to obtain your card details. You may pay for the items which you order online by supplying your credit/debit card details on the secure online order form or via PayPal. Please note that we cannot guarantee the security of data when communicating with Ona Polo via email. Accordingly please do not send us payment information using email. For details of the security measures we employ please read our Privacy Statement. Unless we are fraudulent or negligent we will not be liable to you for any losses caused as a result of unauthorised access to the personal and transactional information you provide us with when placing an order. As soon as we receive notice of your cancellation of an item we will refund the relevant part of the purchase price for that item together with the item’s normal postage charge. We cannot refund any priority, express or courier component of the postage charge. This only applies if the order is cancelled prior to dispatch. These are made within 7 working days from point of order. These are made within 10 working days. Subject to customs inspections and delays. For full information of our delivery service, please click here. Please note that if you order a number of items for delivery to the same address, they may be dispatched separately and we cannot guarantee delivery on the same day unless specific day delivery is selected. However, we are unable to guarantee delivery will be made by the one courier visit. We make every effort to dispatch items on time. If we are unable to deliver the items within your chosen arrival period, we will aim to contact you to discuss your options and dispatch as soon as possible. If the items are not delivered within the time period we specify in the Confirmation Email, please contact our Customer Service by quoting the order reference contained in your Order Confirmation Email. For international delivery of large orders, please contact our Customer Services on +44 (0) 7976 729094 or by email at customerservice@onapolo.com. If you order items for delivery outside the United Kingdom they may be subject to import duties and taxes. These are levied once the items reach the specified destination. You, the customer are responsible for any import duties incurred on your own purchases. We have no prior warning on whether these charges may be incurred or what value they may be. Customs policies vary widely from country to country, so you should contact your local customs office for further information. Customs authorities may request personal information such as Social Security number when inspecting your parcel; failure to provide this information to Customs will result in the parcel being returned. In this instance we are unable to refund the cost of postage and packaging. Please note that for items you order through our Website you are considered the importer and must comply with all laws and regulations of the country in which the items are to be delivered. Please note that cross-border deliveries are subject to opening and inspection by customs authorities. We cannot guarantee that your goods will arrive in the same condition that they were dispatched should they be subject to inspection. It is the policy of The Argentine Trading Company Ltd to ensure that all goods are supplied to our customers in perfect condition and that every possible precaution is taken to protect the integrity of the product that is sold. If you are unhappy with your unused purchase please return it within 28 days along with your receipt for an exchange or refund, by the original method of payment. To this end, it is our policy that we do not exchange or refund personalised items, special orders, or items worn on the body including socks and underwear, except where the item is faulty. If we have sent you an incorrect item, please notify our Customer Services as soon as possible or within 28 days and return the incorrect item to us and specify the correct details in writing. If you would like us to replace the incorrect item with the item you ordered we will send you the correct item as soon as possible or alternatively we will refund the item once it has been returned. We will not charge you for the incorrect item and we must have the incorrect item returned before investigating. Until you return items to us you are responsible for their safe keeping and taking reasonable care of them. We do not accept liability for returned packages damaged during transit back to us. It is your responsibility to wrap products adequately to prevent damage. We will be responsible for any losses you suffer as a direct result of us breaching these On-line Shopping Terms and Conditions if those losses were reasonably foreseeable to both you and us at the time the contract for the sale of items by us to you was formed (i.e. at the point we send the Dispatch Confirmation E-mail to you). We will not be responsible to you or any third party for any business loss (including loss of revenue, profits, contracts, anticipated savings, wasted expenditure, data or goodwill) or any other loss or damage which does not result directly from our actions or the actions of our sub-contractors or agents, is consequential or was not reasonably foreseeable to both you and us when the contract between us was formed. Our liability to you under these On-Line Shopping Terms and Conditions will be limited to 125% of the price charged for the items purchased. Nothing in these On-line Shopping Terms and Conditions excludes our liability to you for personal injury or death caused by our negligence. If you have a published Ona Polo promotion code, please note that offers cannot be used in conjunction with any other offers and offers apply to one per household. Thank you for taking the time to study these terms and conditions. Should you have any further enquiries please contact Customer Relations.